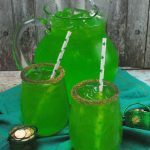 Looking for a Non Alcoholic St. Patrick’s Day Punch that everyone from kids to the adults will love? 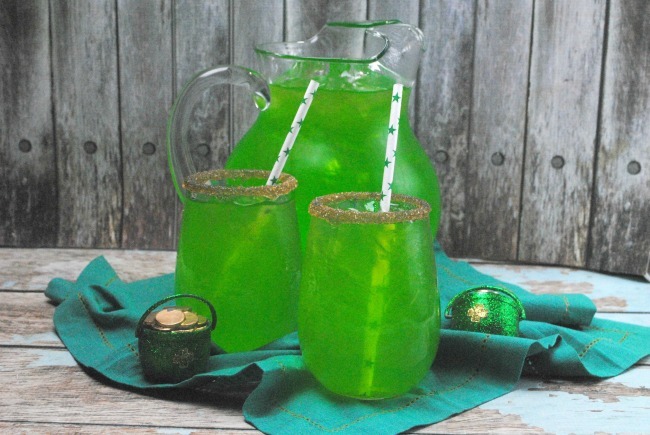 This simple green punch is Non Alcoholic St. Paddy’s Day punch is perfect for picnic or party. Related: Check out these 40 Ways to Celebrate St. Patrick’s Day or Simple St. Patrick’s Day Dessert: Irish Flag Parfait. You might also like Last Minute St. Patrick’s Day Desserts or my Easy Shamrock Stamp from Peppers. We are getting excited for St. Paddy’s Day. I have been pulling out some of my favorite Irish recipes and getting together some great craft ideas together. The kids and I usually get together with some of our family on St. Patrick’s Day. We eat some yummy St. Patrick’s Day food and we have a few Irish inspired drinks together. The kids are often left out of that last part because, well, they are kids and they don’t get to drink. This year, the kids will be indulging in this non alcoholic St. Patrick’s Day punch. It is a green punch with gold sanding sugar. 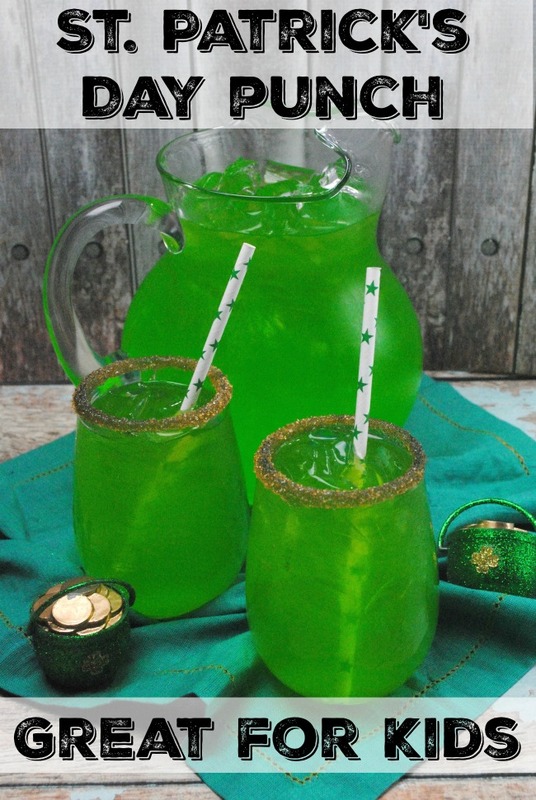 It is perfect for kids and it is a perfect St. Patrick’s Day punch for a party. This St. Paddy’s Day punch can be made a head of time or you can make just as your guests are ready to drink it. It takes almost no time to make. The gold sanding sugar around the edge of the glass makes the punch even more festive. Plus kids love being able to eat the sugar as they drink their green punch. Looking for a fun way to display the green punch before your guests arrive? Line the table with a green table cloth. If you don’t have one, use a strip of fabric from the craft store. It is a great way to add color. Add some festive gold chocolates in a dish. Add the green punch in a glass pitcher and the party is ready. Dip the edges of the glasses into the simple syrup and then into the sanding sugar.